This week's Fabuless Thrifter is Sammy Davis of Sammy Davis Vintage. She started thrift store shopping at age 16 and been going strong for 10 years. "I should thrift a medal to commemorate that," she said. "I love the Goodwill Outlet in Queens -- you just never know what you're going to find, and at only $1.79 a pound it's hard to let anything go!" My favorite piece in the whole look are the flowers in my hair -- made for me compliments (i.e. free!) by Meg Allan Cole Crafts. It's been quite the chilly winter in NYC, but on this day the sun was peeking from behind the clouds and I could feel its rays glow on my face with warmth! So to celebrate the advent of spring I paired a hot color this season that's also representative of springtime's growth -- bright green! -- with a quintessential '70s clothing staple, a white boho top loose enough to comfortably tuck into my maxi. 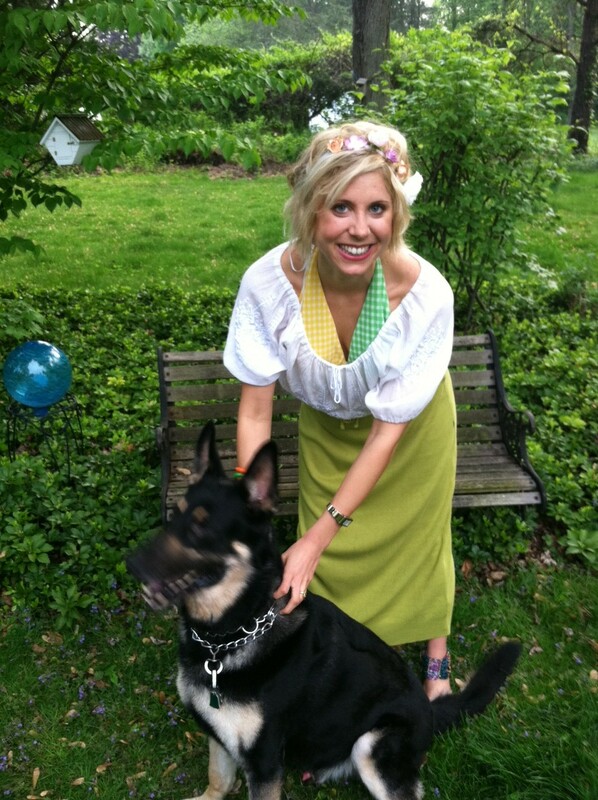 Gladiator sandals and a DIY flower garland in my hair rounded out the look to make me into a vintage style flower child! I'd have to say it was the Hermes scarf (a '90s fashion find!) I "accidentally" (no joke!) thrifted from my hometown Salvation Army in 2010. I loved the pattern -- a variety of African countries around various jungle animals in browns, beiges, blacks and gold -- and bought it for a mere $.50. Little did I know upon returning home, I'd notice the Hermes insignia and freak out! What do you think of Sammy's fabuless look? Follow her on Twitter and like her on Facebook! @sammydavis22 It is certainly my pleasure! Thank you for being my inspiration!